In 2010, Littleton/Conifer local Tootie Boudreau heard of a mare in one of the many barns of a wealthy Manhattan man, who was about to be put down. She had been abused by an outside trainer hired to start her. Once the farm owner found out, the trainer was fired, but the damage to Zoe was already done. People at the farm tried to work with her again, but she was deemed dangerous, unhandleable and unrideable. Tootie bought the 8 year old Registered Irish Draught for $10, now named She’s Got Game aka “Zoe”. 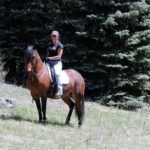 As a trained physical therapist and experienced horse trainer in several disciplines, Tootie felt she was up to the challenge and wanted to give Zoe one last chance. Tootie was living in Massachusetts at the time and began working diligently to gain Zoe’s trust. At times, every aspect of daily life was a challenge: trailering; housing; health issues between the both of them; ground manners and even other handlers. But all of the experiences led to the unbreakable trust that they now share. In just a couple months, Zoe and Tootie were winning ribbons in the Jumper ring and soon after in Eventing. Zoe turned out to be a natural and effortless jumper and Tootie had the experience and talent to hold on as the horse rose up the levels in Jumping and Eventing. As some Eventer’s joke, “I’m just here for the jumps”. For Tootie and Zoe that may have been their comfort zone, but their dedication to improve in all aspects of the sport has kept them progressing in their Dressage training and scoring as well. As a testament to the versatility of this large Irish Draught mare, while living in Pennsylvania, Tootie and Zoe won the 2013 National Old People’s Riding Club Versatility contest by scoring highest in the Dressage test and Gambler’s Choice Jumper classes, out of more than 20 total entries, plus they came in second in the western trail, barrel racing, and pole bending classes that same day. When scores were tallied for over ~150 NOPRC clubs all over the nation, Tootie and Zoe were ranked number one in Gambler’s Choice Jumpers, Dressage and then they came in 4th in pole bending and 5th in barrel racing. All without having any experience or e exposure to the Western events prior to that show day! After a year of living in the Eventing mecca of Pennsylvania, Tootie and Zoe moved to Colorado to be with Tootie’s boyfriend Gary in October of 2013. Also a horseman, Gary had several horses of his own at his place. 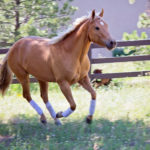 At her new home in Colorado, Zoe fell into a mysterious cycle of colic episodes and strange health issues that several local veterinarians had difficulty putting a finger on. 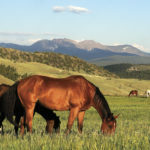 Possibly, along with some other east coast horses moving to Colorado, Zoe may have ultimately had a hard time adjusting to the climate, elevation and fluxuating temperatures. She was endoscoped once and no ulcers were seen, but later a second scope revealed that she did have significant ulcers, which helped to explain some of the problems. With ulcer treatment underway, Tootie came to the realization that she was just not able to ride like she needed and wanted to at home and Zoe needed her own large area with shelter and free choice hay. Tootie found just that for her and moved Zoe to Jean & Skip Boettcher’s Meadow Ridge Ranch in Conifer. Zoe and Tootie have thrived there with excellent care and a great facility that offers an indoor arena. Moving from Pennsylvania to Colorado has presented a stark contrast in local horse cultures, but the pair had an excellent year in 2014 – coming in 2nd place at Training Level at the Colorado Horse Park August 21st -24th and receiving 2nd place for the Charles Owen Technical Merit Award for Best Cross County Rider at the FEI level event. This qualified them for the American Eventing Championships in September in Tyler, Texas. Supported by the financial help of several new friends in Colorado and old friends and family back East, Tootie and Zoe headed to Texas and finished with a top 20 placing against the best in the country, jumping clear in cross country and double clear in stadium jumping. This past Christmas, Gary gave Tootie the book How Good Riders Get Good by Denny Emerson. The book has been revolutionary for Tootie in her riding and personal life. It has helped her see where she can improve and identifies what she already has going her way. As with many, if not all aspects of living life intentionally, riding truths intersect, compliment and are in harmony with overall life truths. A couple of significant points of emphasis have risen to the top for 2015. 1) to set specific riding goals, and 2), to find an upper level Eventing mentor. Already in place are her persistence, a supportive partner and a job that allows her the flexibility to ride and compete. Tootie works as a Physical Therapist in the Jefferson County School District and enjoys a school schedule which allows her to ride in the afternoons, during breaks and to compete in the summer months. Of course having an amazingly talented horse partner is the icing on the cake! Zoe and Tootie are spending the winter in the indoor arena honing their Dressage skills and preparing for the 2015 Eventing season. They have set their sights on seeking out sponsorships as well. Zoe still will only accept Tootie as her rider, unless it is to take a kid out for a spin!